Most of us have heard the saying, “An ounce of prevention is worth a pound of cure.” The second part of the saying is, “A little precaution before a crisis occurs is preferable to a lot of time cleaning up afterward.” That certainly applies to efforts to stop the spread of aquatic invasive species such as zebra mussels. Last year’s monitoring showed that Big McKenzie Lake, which straddles the border between Washburn and Burnett Counties, had a population of approximately 20 zebra mussels per square foot. Two adults were verified downstream in Middle McKenzie Lake. Fortunately no zebra mussels were found in any northwest Wisconsin lake outside of the McKenzie watershed. Increased watercraft decontamination will be a key component in this year’s battle to stop further spread of zebra mussels in the area. Over the winter, Washburn and Burnett Counties passed matching decontamination amendments to their existing AIS ordinances. County law now requires that “If a decontamination station is available for use at a public or private access, the boater shall decontaminate per posted directions using the station provided.” A decontamination station is defined as “a device provided at a public or private lake access to remove all potential invasive species. 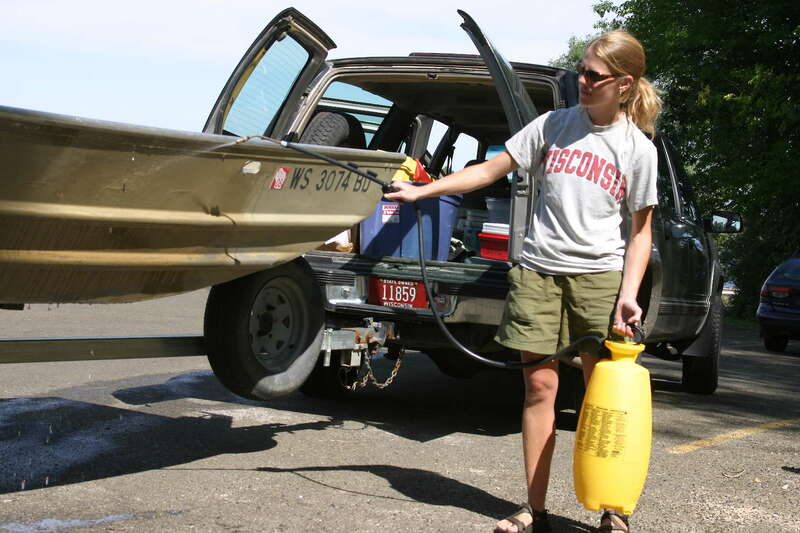 The station may consist of high temperature water (140 degrees or more) applied with a pressure washer by trained personnel, a recommended chemical solution applied with a low pressure sprayer, or other techniques or devices.” These measures will also help avoid the spread of other aquatic invasive species. County staff and area lake associations are working hard to make decontamination equipment available at more landings. Last fall, a high-pressure hot water decontamination unit was purchased by Burnett County, McKenzie Lakes Association, Washburn County Lakes & Rivers Association (WCLRA) and Burnett County Lakes & Rivers Association (BCLRA). This decontamination unit will be used mainly in the McKenzie Lakes area by trained operators. Last summer, lake associations in the vicinity of Big McKenzie developed self-service decontamination stations for their landings, consisting of a very mild bleach solution. 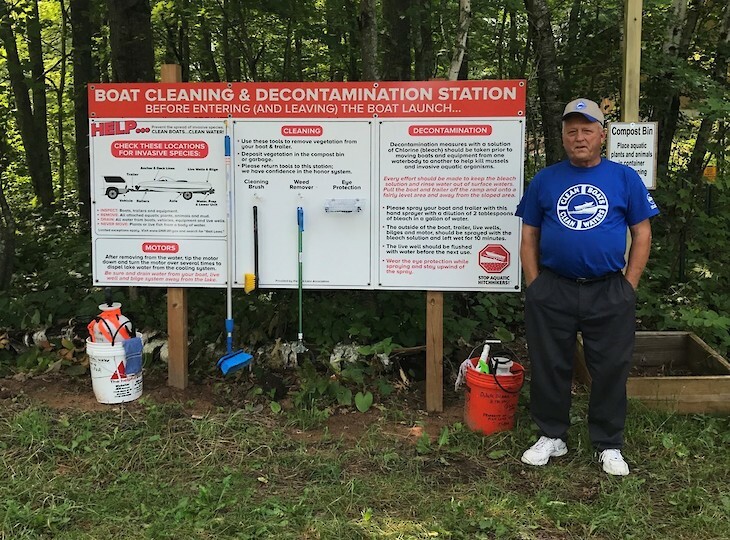 Each station has an instructional sign, a small hand-pump sprayer with the bleach solution, and other tools for cleaning watercraft. Burnett and Washburn County Staff, WCLRA and BCLRA have launched a joint project to help other lake associations in the two counties purchase signs and set up similar stations. It is crucial that property owners and lake users look for and report any new findings of zebra mussels in this area. Lisa Burns, Washburn Co. Land & Water Conservation, and Kris Larsen, WDNR have compiled a Northwest Wisconsin Zebra Mussel Rapid Response Plan. This plan is available at wclra.org along with other news and current documents pertaining to zebra mussels. For more information or questions, contact Lisa Burns, at 715-468-4654, lburns@co.washington.wi.us. Submitted by Cathie Erickson, board member with Washburn County Lakes and Rivers Association, and Lisa Burns, conservation coordinator with the Washburn County Land and Water Conservation Department. Both are members of the Zebra Mussel Response Team.